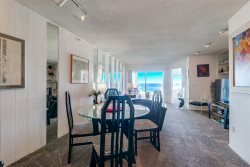 A gorgeous three bedroom, two bathroom condo located directly on the sand in Ocean Beach, is the perfect location for a family summer vacation. NO MORE THAN SIX PEOPLE UNLESS APPROVED. Spanning 1,950 sq. 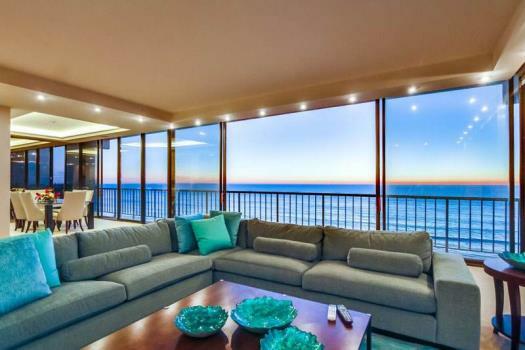 ft. and highlighted by panoramic ocean views, you can also enjoy a quick walk for a surf, watch your children play on the sand and enjoy breathtaking sunsets. The first floor is home to beautiful tiles floors which run from the entry way and through the dining room, kitchen, living room plus the first bedroom and bathroom. Another family room is located on the second floor, along with the master bedroom, third bedroom and second bathroom. Finally, the property is pet friendly and Dog Beach is located 300 yards around the corner. Finally, there are two reserved parking spots and laundry on site. No oversized trucks, vans or campers permitted. There is a strict HOA curfew on noise from 10 PM to 7 AM. I absolutely adore the place. With a few exceptions it is perfect. The location is great, walkable to everywhere in town. Having the beach right outside the door is wonderful. Of course my dog, Honey, enjoys the close proximity to the dog beach. Everyone we spoke with on the phone was exceptionally friendly, efficient and helpful. Booking a reservation is very easy either on-line or over the phone. The agency does a fantastic job of emailing everything and keeping you informed. Jeff, who manages the vacation rentals is an amazing person. Very warm, friendly, kind, efficient and helpful. The agency is there for you if you would encounter any difficulties during your stay. We recommend them with the highest regard. We have traveled extensively for more than 40 years and found this rental house to be quite wonderful. Terrific location, well-equipped, clean and most comfortable. It was situated in a small group of condos and it was very quiet and the neighbors we did encounter were very helpful and friendly. We always got a quick response whenever we had a question. We had a lovely, relaxing time. Beautiful house, excellent location, great amenities!!! What an amazing place. I literally just had one of the best vacations ever at Brighton Tides. Lovely house, ON the beach, at the right price. Can't wait to go back.